One of the biggest tensions in both politics and culture is the balance between membership in an ethnic community and the sense of belonging it provides versus a more capacious mentality with respect to respecting democratic ideals of inclusiveness and fairness. Many current cultural and political problems trace their roots to multicultural situations and settings where social cohesion is lost as settings become more diverse. Consequently, politics is essentially about the management of differences. And one of the most difficult differences to manage is ethnic identity which offers a strong sense of belonging but is quite dumbfounded when it comes to developing intergroup cooperation and an identity sufficiently broad enough to include both sides of a conflict. The “received” deliberative democracy literature is mostly broad and normative focusing on abstractions about how to reconcile differences in a democratic manner. But one of the underappreciated difficulties of the more theoretical approach to deliberation is that it fails to sufficiently embrace the matter of power asymmetries. These are when values and interests are deeply entrenched and inequality is part of the natural state of affairs between two groups such that one side is economically and militarily superior. The first and most important question is how one imagines deeply divided societies or groups coming together. Ethnopolitically divided societies might live near each other and tolerate a side-by-side existence, but they can’t share trust and a sense of community. The two sides must ultimately work to transform the context, the individuals, and their cultural differences in order to create a relationship rooted more in mutuality than rank group identification. On one level, this involves transforming identities – which is theoretically possible because identities are described as social constructions which means they can be constructed, deconstructed, and reorganized. This is the transformative and epistemic sense of deliberation which believes in the gradual process of creating new relationships and shared communities. Again, the question remains as to how this transformation happens. Or, what is the mechanism or interaction pattern responsible for achieving this new state of affairs. Rigorous and serious deliberation is an antidote to communication based on bargaining, trading off interests, and manipulations designed to achieve private goals. Deliberation is about interest and preference formation. But in the case of deliberation for divided societies power asymmetries must be accounted for. In fact, it makes little sense to ignore just the defining issue that is the root of the conflict. Differences between divided societies are usually moral and cultural in nature but it is close to impossible to arrive at moral consensus between ethnopolitically separated groups. This is where what I call “Reasonable Disagreement” (Chapter 3 in my most recent book Fierce Entanglements: Communication and Ethnopolitical Conflict) can be helpful. Reasonable disagreement – the details of which are beyond the concerns of this posting – begins by treating the other not as an enemy but as an adversary as Iris Young argues. Reasonable disagreement is simply the assumption that there is more than one defensible way to make an argument or hold a belief. It recognizes that one group’s worldview is not necessarily or clearly superior or correct. There is simply no way to manage differences and develop cultural sensitivity between groups without their remaining gaps of meaning and understanding that simply must be tolerated. Viewing the other side of a divided society as an “enemy” requires vanquishing him or her because the other side is typically considered wrong and worthy of annihilation (either literally or symbolically). “Adversaries”, on the other hand, are respected worthy opponents that cannot be thoroughly vanquished. 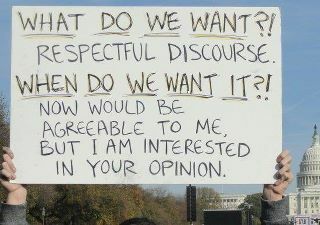 Reasonable disagreement has two senses: the first is as a political value to be nurtured and developed in a democratic society. It is a foundational plank of the requirements for tolerance and diversity in liberal democratic societies. The second sense is as an epistemic value responsible for new and creative decision-making. I think the challenges of ethnopolitically divided societies are going to be the subject of increasing research and theoretical attention in the future – and rightfully so.